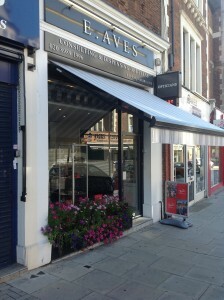 E. Aves Opticians was originally set up by Ernest Aves, over 80 years ago. It was taken over by Alex Hudson in 1958 and then Kerk Davies in 1985. Kerk renovated and modernised the practice then began to build up a steady, loyal patient-base. Understanding the importance of good-quality, independent businesses – Kerk and his colleagues have spent over 20 years working hard to create an inviting environment for people to come for an eye test, to ask for eyecare advice or to peruse the designer spectacles and sunglasses. Offering both NHS and private eyes tests Kerk, and his fellow opticians, aim to cater for everyone in the local community – from those with straight forward visual needs to those with more complex diabetic, glaucoma or macula degenerative issues. Keen to keep up with the latest developments in optics – the team at Aves Opticians ensure they have the latest lens materials to choose from, including thinner and lighter lenses, and all the latest coatings. They also carry a wide range of contact lenses – and offer direct debit payment plans.